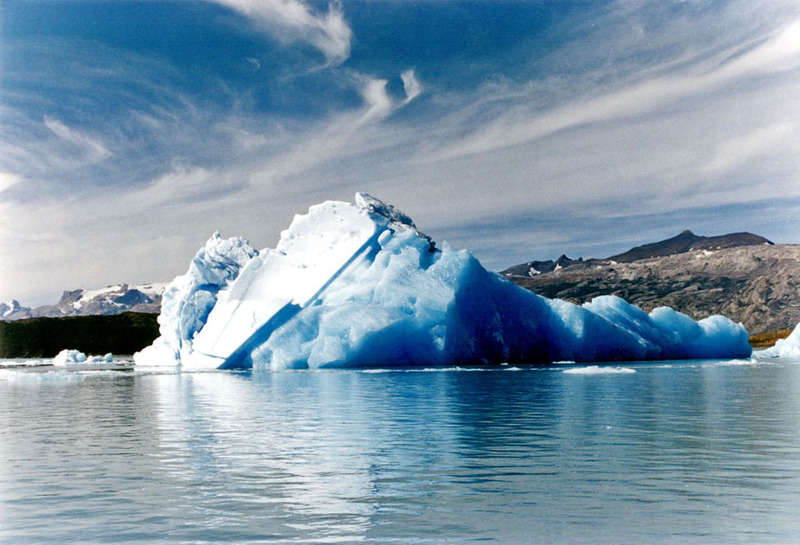 Water is unlike other substances because its solid form — like this iceberg — is less dense than its liquid form — like this ocean. Scientists are studying other weird properties of water. 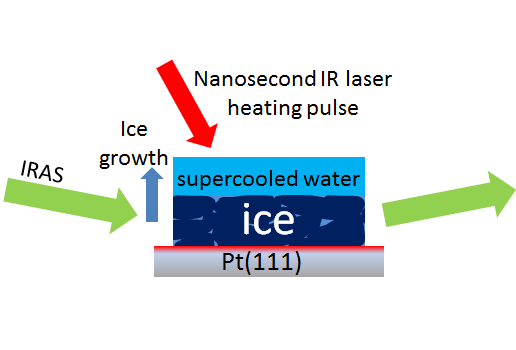 A laser (red arrow) creates a tiny drop of supercooled water above ice, allowing scientists to use a method called IRAS (green arrows) to measure in nanoseconds how fast supercooled water turns back into ice. RICHLAND, Wash. — Water has many unusual properties, such as its solid form, ice, being able to float in liquid water, and they get weirder below its freezing point. Supercooled water — below freezing but still a liquid — is notoriously difficult to study. Some researchers thought supercooled water behaved oddly within a particularly cold range, snapping from a liquid into a solid, instantaneously crystallizing at a particular temperature like something out of a Kurt Vonnegut novel. Now, researchers have figured out a way to take snapshots of water freezing within that deeply supercooled range. And guess what? Water isn't as weird as it could be. Liquid water can exist all the way down, crystallizing into a solid more slowly as things get colder — as expected, but never all at once. A team of researchers from the Department of Energy's Pacific Northwest National Laboratory reported the work in this week's Proceedings of the National Academy of Sciences Early Edition online. Although the results won't change the way you make your iced tea in the summer, it might help theorists flesh out their understanding of water and help atmospheric scientists better understand rain and clouds. Most people know that ice floats on liquid water, but they might not be aware that water has a hard time forming a glass. A glass — like a window — is a solid in which the molecules are actually arranged as they would be in a liquid. Take a bunch of oranges. Oranges jumbled loosely in a bag are like a liquid — the individual molecules can move around pretty freely. If you pack the oranges neatly in a box, you form a crystal. If you tighten the bag and stop the jumbled oranges from moving around but without arranging them neatly, you form a glass. Glasses are great because they can hold contaminants — think a fly in amber, or nuclear waste in vitrified glass — whereas crystals kick out contaminants — freezing seawater is one way to desalinate it. To make a glass, researchers melt sand or another component until it is liquid. And then they cool it so fast it can't form a crystal before it solidifies. But freeze bulk water fast and it does not form a glass. It rapidly becomes ice. To become glass, liquid water must be cooled to a deeply subzero temperature within microseconds — about 136 Kelvin (about minus 215 degrees F), a temperature common in outer space, where some expect glassy water to exist. The range that has been difficult to study is slightly above that so-called glass transition temperature. Scientists don't know what's going on between about 160 and 235 K. (In real life, that's between the temperature on Mars's moon Phobos and Fairbanks, Alaska, in the depth of winter.) At the high end of that range (closer to 235 K, Fairbanks), water freezes from a supercooled liquid to a crystal in milliseconds, which is way too fast for current analytical techniques to study. Scientists came up with a variety of ideas to explain what might be going on in that unexplored region. They wondered if the water would remain metastable — liquid but poised to start crystallizing at a moment's notice — all the way down to temperatures where it becomes a glass. Or if the liquid would become unstable somewhere warmer than that, around 228 K (a little warmer than the record lows at McMurdo Station in Antarctica), at which point it would spontaneously crystallize due to what physicists call a singularity. Also, something within that range might be happening that can help explain why water has a hard time forming a glass. "There was a plethora of postulates but a paucity of data," said PNNL chemical physicist Bruce Kay. "Our goal was to develop a new technique to rapidly heat and cool nanoscale supercooled water films," said PNNL physicist Greg Kimmel. To get the data in that unmeasurable range, Kimmel and Kay worked with Yuntao Xu, a laser expert, and others at PNNL and developed a way to heat and cool water on nanosecond timescales with a laser. Using this method, the PNNL scientists measured how quickly the supercooled water converted into crystalline ice as the temperature decreased. The crystallization time dropped from nanoseconds near the highest temperatures to hours at 126 K. At no point, especially at 228 K, did the supercooled water snap into a crystal, ruling out the possibility of a singularity. To look for the singularity from another angle, the researchers explored how fast the molecules of supercooled water could move, and how much that changed as it got colder. If the singularity existed, they would expect the water molecules to be unable to move at some point. From the freezing point down to the glassing point, the molecules moved slower and slower in a complex but continuous fashion. Overall, the relation between the temperature and how fast the molecules could move did not suggest a singularity at 228 K.
"We can probably take the singularity off the table," said PNNL's Kay. Taken together, the results provide valuable insight into how water behaves. "For example, in atmospheric chemistry, supercooled drops of water are found in clouds. There are questions about how long they persist," said PNNL's Kimmel. This work was performed in EMSL, the Environmental Molecular Sciences Laboratory, a DOE Office of Science User Facility at PNNL. This work was supported by the Department of Energy Office of Science. Reference: Yuntao Xu, Nikolay G. Petrik, R. Scott Smith, Bruce D. Kay and Greg A. Kimmel. The growth rate of crystalline ice and the diffusivity of supercooled water from 126 K to 262 K, Proc Natl Acad Sci U S A Early Edition, December 12, 2016, DOI: 10.1073/pnas.1611395114.